This 30-acre entertainment complex has it all! In addition to its nightclubs, restaurants, shops and cinemas, CityWalk is also host to a variety of concerts and special events throughout the year. For dining options, there is something for everyone, from hot dogs to haute cuisine. Fast food options include Panda Express, Burger King Whopper Bar, and Moe’s Southwest Grill. To name just a few of the restaurants here, you have the NBC Sports Grill & Brew, Emeril’s Restaurant Orlando, Hard Rock Café, Antojitos Authentic Mexican Food, and Jimmy Buffet’s Margaritaville. Of course there are plenty of shops and boutiques here so you can bring home plenty of souvenirs. 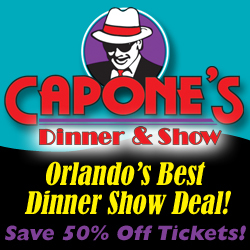 You can find the latest fashions, novelty items, jewelry, cigars, candy, toys, and much more. Some of the stores include Element, Fossil, and the Universal Studios Store, where you can get all of your theme park and character merchandise. Many of CityWalk’s restaurants have their own merchandise areas as well, so you can stock up on official gear from Bubba Gump Shrimp, Jimmy Buffett and the Hard Rock Cafe®. You can even take home a ‘permanent’ souvenir from the Hart & Huntington Tattoo Company! 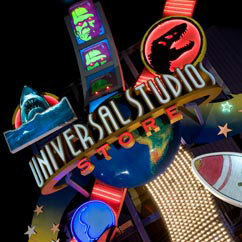 Although Universal Orlando is a great place to bring the kids, it isn’t ALL about the kids! Adults will find some great places to play at the many bars and nightclubs. Check out the dueling pianos at Pat O’Brien’s, enjoy a martini at the Red Coconut Club, dance the night away at the Groove or Latin Quarter, or even karaoke at CitiWalk’s Rising Star. There are also several places to enjoy live music including Hard Rock Live, Jimmy Buffet’s Margaritaville, and reggae at Bob Marley-A Tribute to Freedom. For great family entertainment options, check out the AMC Universal Cineplex 20 movie theater, featuring all-stadium seating. Or, for a totally unique experience, check out the Blue Man Group. This world-renowned show is packed with musical instruments, a live band, comedy, multimedia theatrics, audience interaction, and LOTS of paint! It is a captivating, exciting show for children and adults, although may not be appropriate for children under 3. And, you can enjoy free admission to participating clubs by showing your Blue Man Group ticket stub. You can see the Blue Man Group at the Sharp AQUOS Theatre, just across the bridge from CityWalk, located between the Hard Rock Cafe® and the main entrance to Universal Studios Florida. So, for tasty food, great shopping, and plenty of entertainment options, be sure to visit Universal CityWalk, the self-proclaimed Entertainment Capital of Orlando.